This is a continuation of last week’s rant about why so much of mat design -- mostly by dumb luck -- is well suited to riding waves. 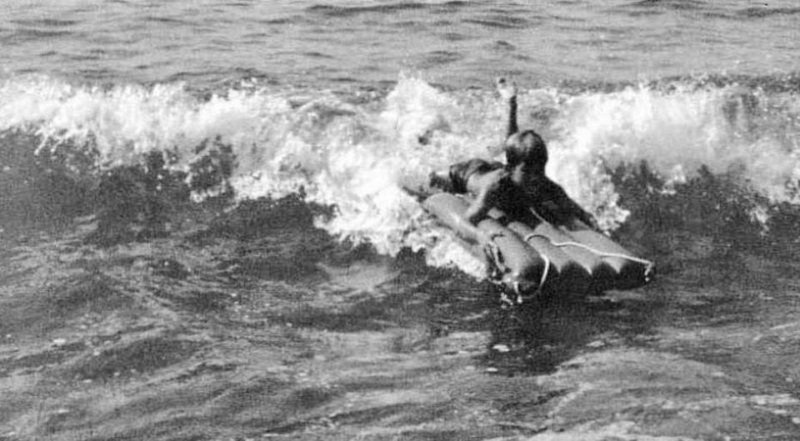 And not just suited to riding up to the shore on a foot high bit of white water...but also riding quality waves in a fast, “effective” manner. Of the many "natural" elements of mat design, the round rail is the most misunderstood in the eyes of the average board rider. The fat, round rail shape is one of the reasons that even older, heavier, stiffer mats can attain such amazing speed. Yet that flies in the face of “conventional rail design wisdom.” Most surfers today believe that low, edgy rails hold in better and are faster…while round rails are sluggish and slide out. ...and a hard bottom turn with only the fat part of the inside/lower rail in the water. Flippers completely free of contact as well. Pure rail hold. 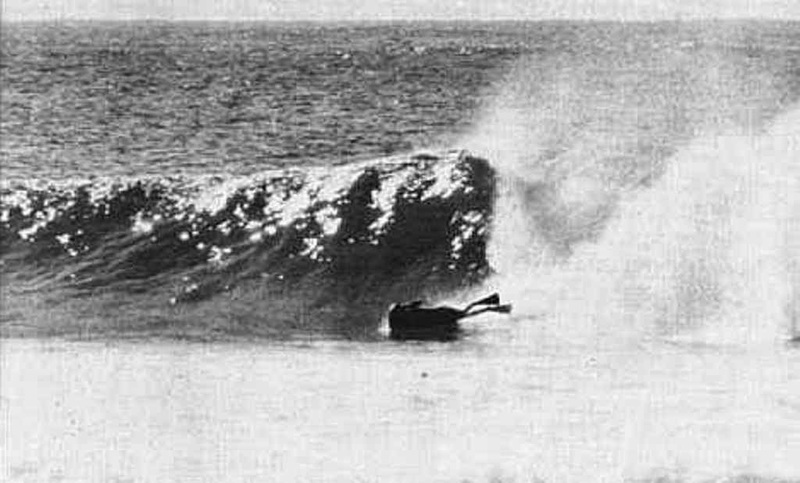 Misconceptions about round rails came about in the late 60’s, when stand up surfboards suddenly dropped in width from over 22” wide to under 19” wide…a huge difference. Experimental low rails accompanied that shift in thinking, and because the new narrow miniguns held in better, most people concluded that low rails were the reason why. In truth, it was the severe reduction in width that was providing the added hold that was so exciting to everyone at the time...but the myth that low rails were the deciding factor in this improvement persists to this day. ...you can plainly see Harrison's narrow hull held in as well as the narrow down railers being ridden at the same time. Because it was the width, not the rail shape, that did the "work." 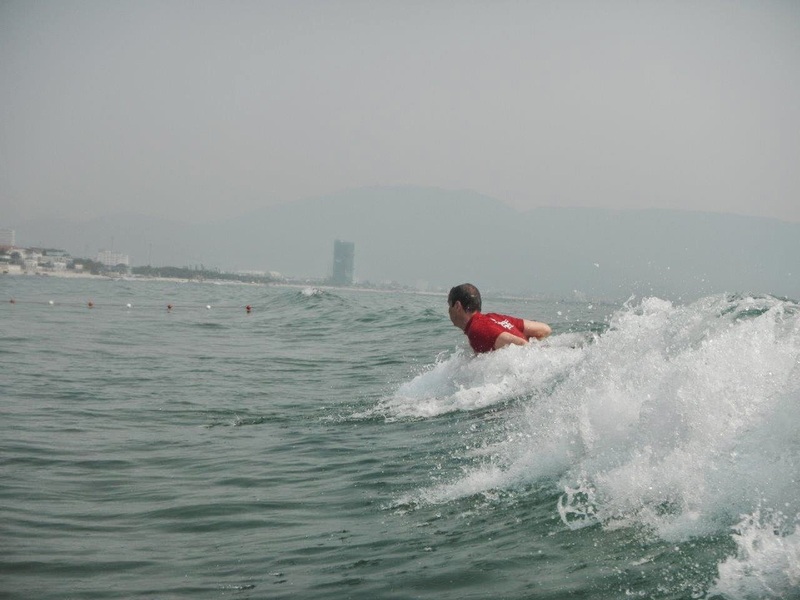 Flat bottoms and low rails shear the water away from the board...which isn't a bad thing! Boards with low rails can skate and pivot around ‘at will’ because the board isn’t glued to the wall of the wave. Back in the 70’s, that lack of rail grip was compensated for by narrow boards with narrow tails. These days, tails have widened back up, proportionately. And, in the case of the ubiquitous thruster design, three fins are needed to give the rider command over the board without spinning out. 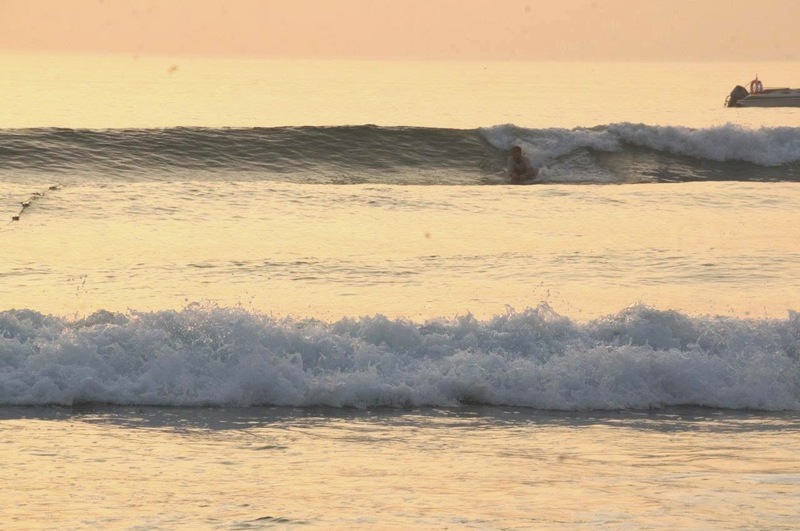 It’s a combination of extremes – flat bottom, low rails, and a lot of fin area -- that obviously works well. But low rails DO NOT do the work of holding in. The fins do. 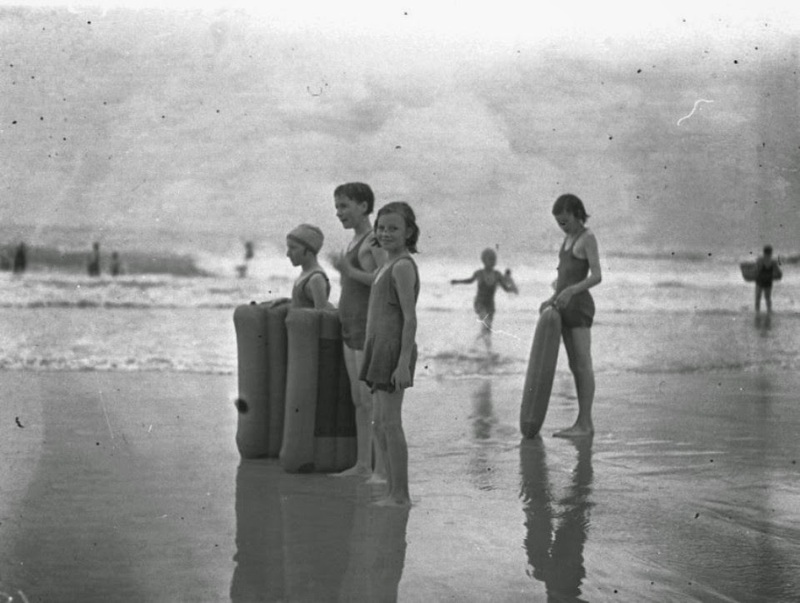 The finless boards prior to 1950 had round bottoms and rails, because "round" generates a severe low pressure area when water passes over it (or it passes over the water). And that low pressure area draws the rail into the wall of the wave. To observe this suction effect, try holding a soup spoon under a stream of running tap water, and feel the round side quickly draw into the moving water, while the concave side kicks away from the water. 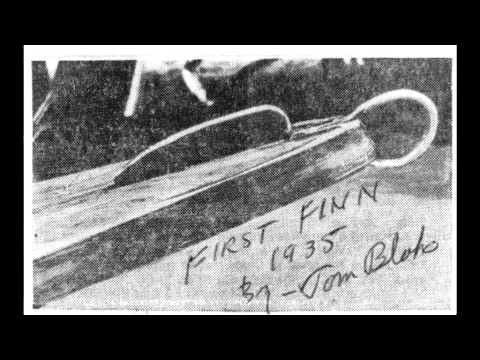 An interesting historical side-note is that the fin was first used by Tom Blake in the 1930’s to control the forward motion of his hollow wooden paddle boards...the same paddle boards that had box rails with an edge going around the entire bottom due to their construction. 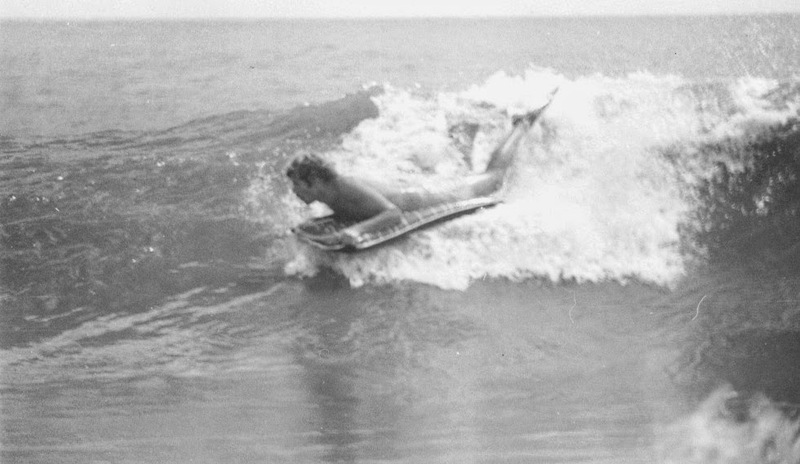 Fins and low rails were a copasetic pairing from day-one...because Blake's early "low rails" didn't hold in. 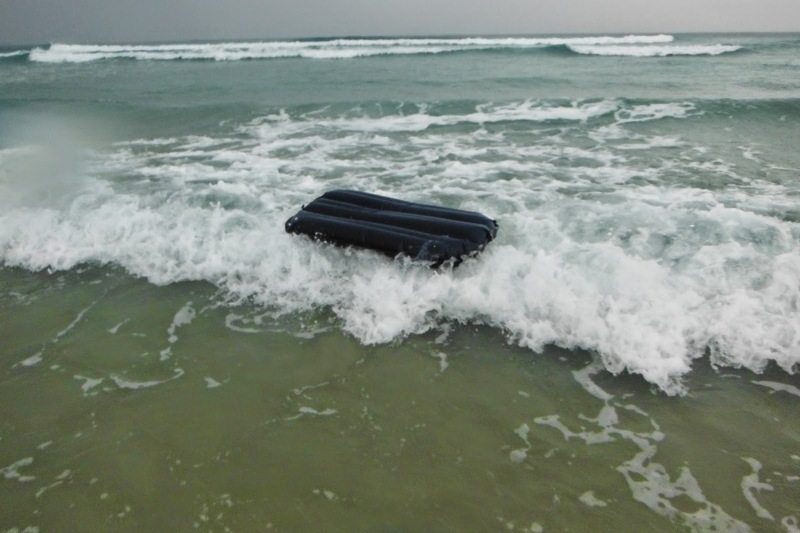 In the case of our surf mats, we have a round rail shape that's naturally generated by an inflated sheet of fabric. And, on top of that, we have a nifty little flange running around the perimeter – again, due to construction technique rather than the intent of the original designers. That flange shears water away from the top half of the rail in lower speed situations…a nice addition to an already good design package. 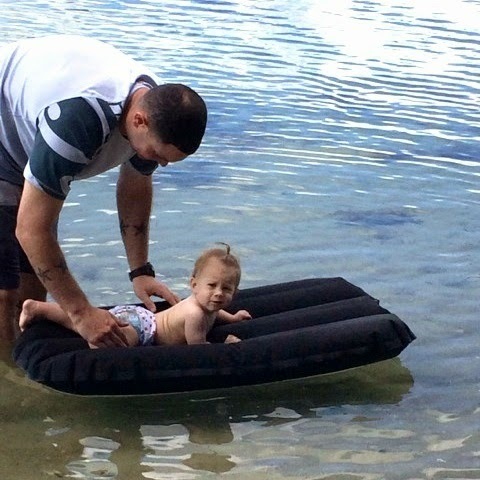 Easily controlled rocker also makes riding bumpy waves a new sport! So we had the makings of a great wave riding vehicle already in place as the basic air mat was originally built....a parallel outline, flat rocker, no fin, round rails, a flange, and some nice flexural tendencies. With so much going for mats straight out of the starting gate, where did we go from there? And why? Highly subjective answers coming soon! Back from the wild west (Western Australia) and took henry’s XL Special mat and my 4GF Standard. I found the XL worked good in the bigger more powerful waves. Also had a mat meet with a few other like minded mat sliders. 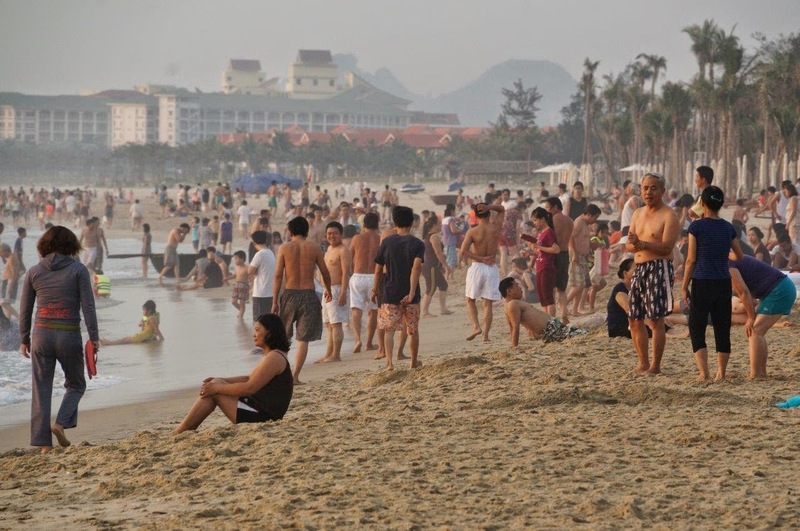 I hope I have given you and the viewers a bit of an idea what the last trip was like. 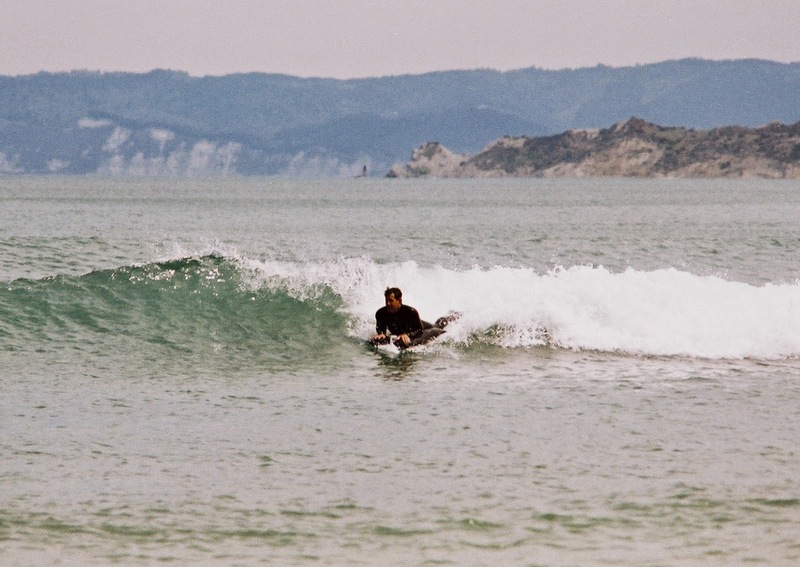 We surfed a heap of other spots as well but was unable to capture any photographic evidence. I took 5 mats with visions of riding different models as well as having back ups in case of any failures or losses. As it worked out I only rode 1 mat the whole time except twice, once being the Standard in 1 foot onshore, and once a 5GF in a hip height left and right peak. The rest of the time it was the Lotus 7. 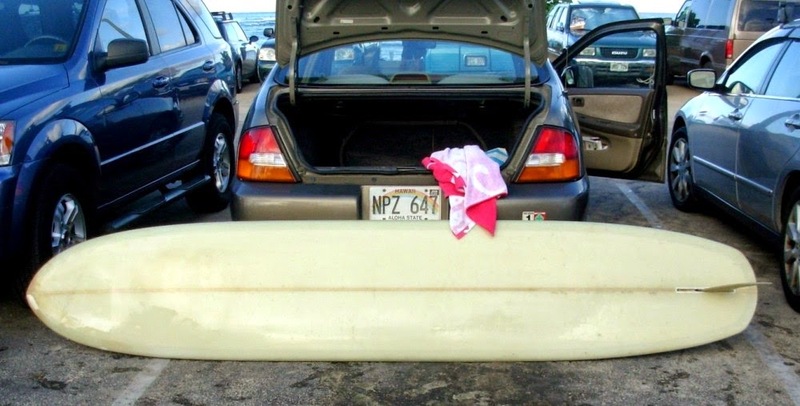 I stuck with that mat as the surf was pumping and I just felt so confident riding it. 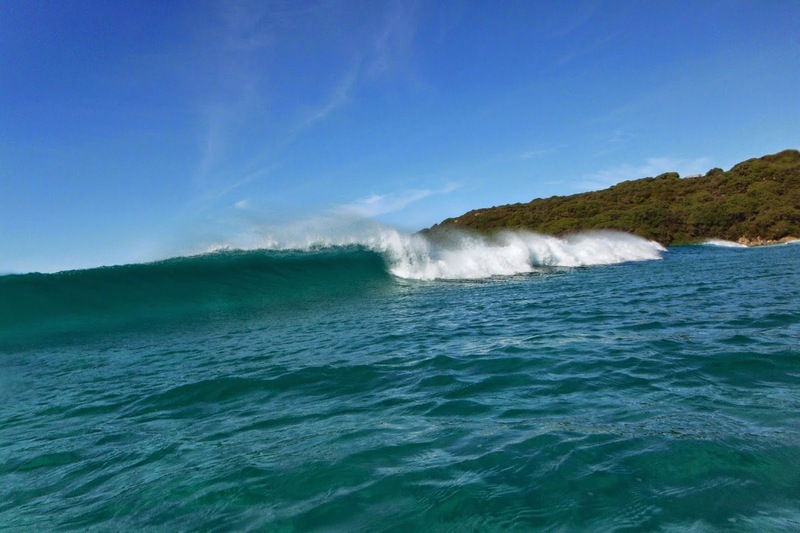 It performed excellently in all sizes of waves, which were all reef breaks. It just loves the indo power. 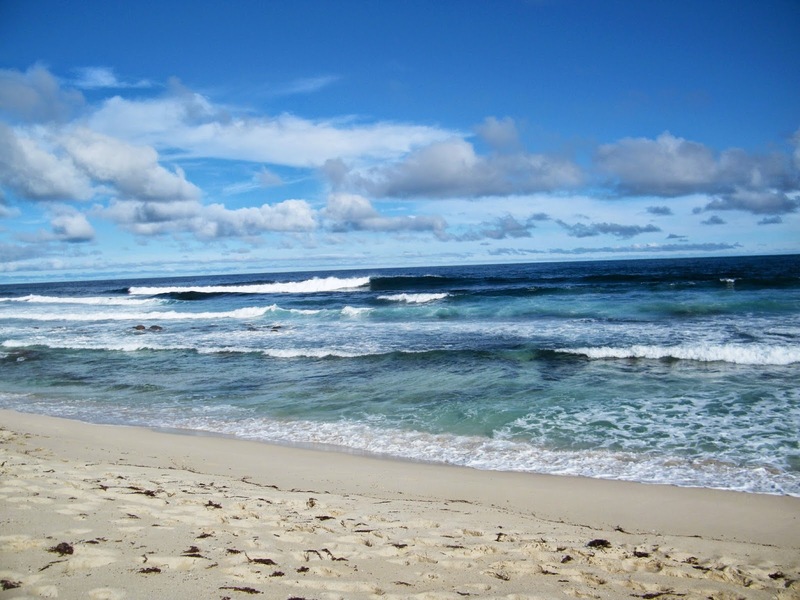 In 28 days I surfed 25 days including the day I arrived and the day I flew out. 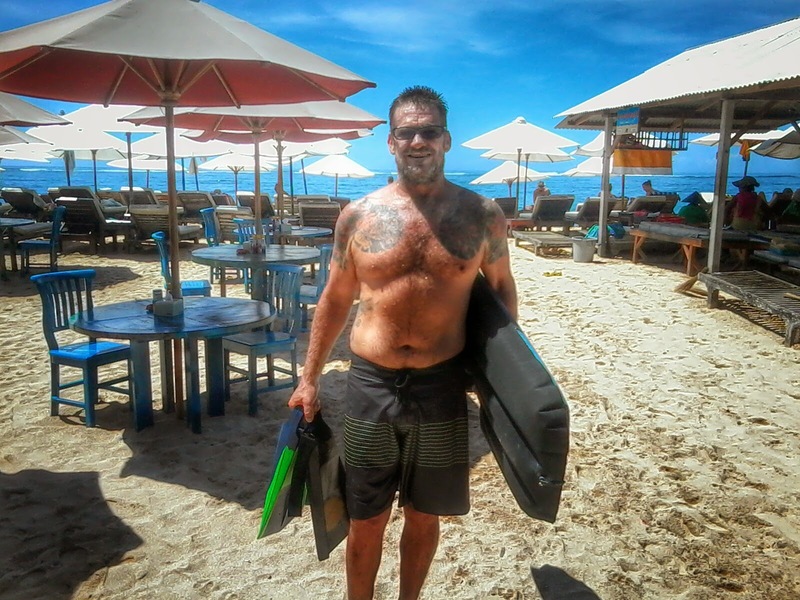 One day I wasn't allowed to surf as it was Hari Nypei , one day traveling and one day surfed out (read hungover). 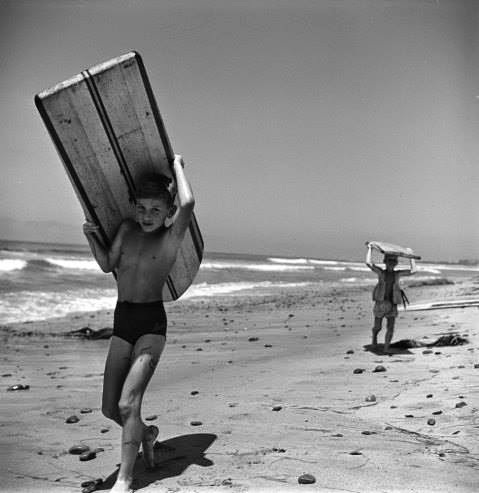 Surfed at least once a day, but most days 2 or 3 times and a couple of days 4 times. Combined with a couple of weeks late last year this mat has had 6 weeks of heavy abuse in Indo conditions, from 2 - 10 feet waves (measured from the back), washed over reefs, washed into rocks, extreme sun and used as a pillow. Many times I would flip the mat putting the heavy deck between me and the reef, whether it be paddling across the reef, exiting or what ever there was times where it was good to have the security of a bit of solid material. One time I brushed over a big brain coral deck down and on inspection there was a slight scuff but a strong smell of coral wafting from the otherwise unharmed deck. At times I was rag dolled so badly clinging desperately with a bear hug to a limp mat that I feared the valve had popped only to have the mat pressurize as the mat carried me to the surface. So this mat has had some heavy usage and today it still looks as new as when it came out of the box. This is a testament to the durability and quality of Fourth Gear Flyers. I always take a spare flipper or like last trip a spare pair. In four trips Ive need the spare twice. One time a viper failed at the drain hole and last trip a duck feet at the heel strap. While both were still usable they may not have lasted much longer so it was good to have a spare. 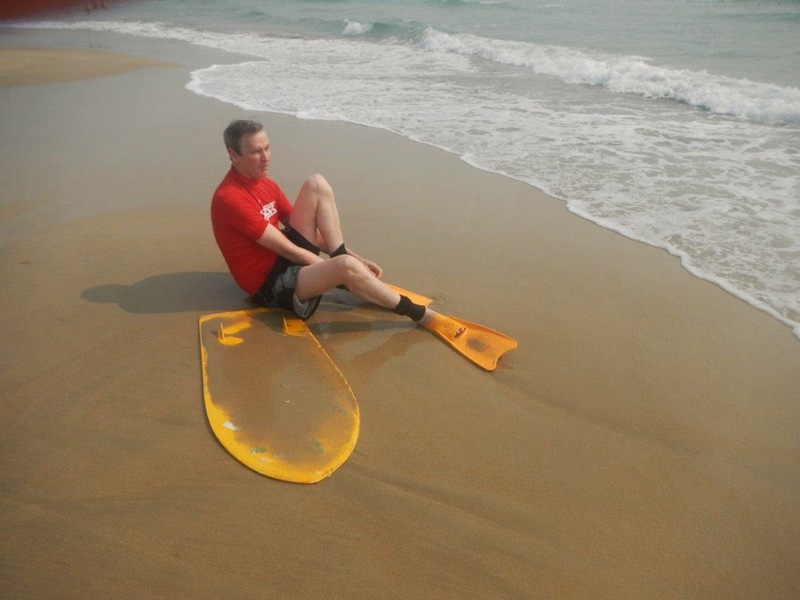 I was surprised how hard the surf was on flippers as I rarely break one at home. Fin savers are an absolute must and they must be in good condition. One previous trip the velcro was coming undone every other wave and every duck dive so I had to resort to tying a reef knot with the velcro. It actually worked well, even too well as it is very difficult to untie a reef knot in velcro ! Hats are almost a necessity in the tropics even though they are annoying to get used to and give you bad posture on the mat. The last tip I have is very simple but It took me a while to work it out. Riding motor scooters as the favoured transport in Indo I have tried heaps of different methods to transport my matting gear including sitting on the mat, using a back pack, using tie downs on the back of the seat etc etc until I discovered this most effective and simple way. All you do is roll up your mat ( rash vest can also be rolled up) and fasten with a finsaver. Then take the remaining finsaver and loop the two flippers together. Then the flippers and mat firmly secured together by fin savers are simply hung on the luggage hook on the scooter dash. I guess a lot of matters use this technique... just took me while to figure it out ... doh ! 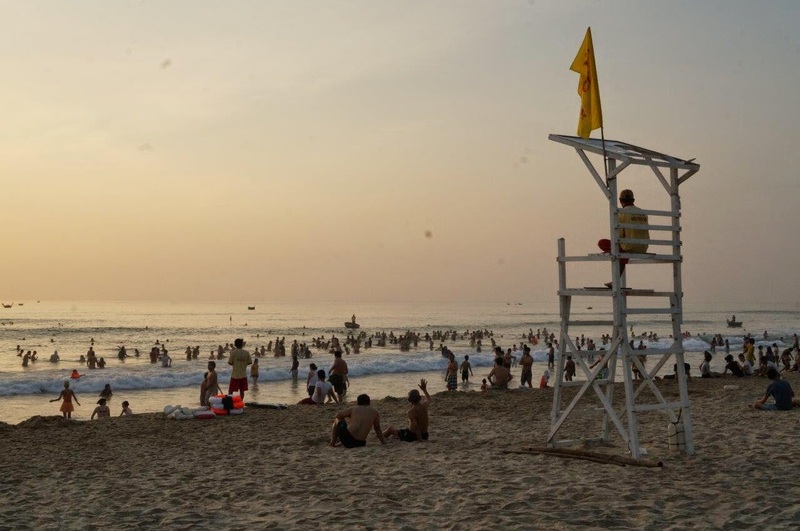 Apart from nearly drowning and popping my knee out ( luckily it clicked back in a few hours later) on the second day in big waves including a big swim, I remained mostly injury free. Except for a few urchins, cuts, scrapes and the worst of all a couple of strained knuckles. My first knuckle on my right hand pointer is still sore from hanging on. Last day last surf and yes it was pumping. A very happy 4GF rider ! Thanks to Paul and 4GF. 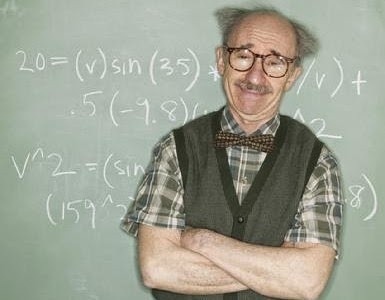 So what does Finagle’s Law have to do with us, the elite mat surfing community? Mat design, as it turns out, is “right” most of the time. While it’s hard to build a really great mat, making a serviceable one is pretty darn easy. And that's why mat surfing was able to flourish as smashing good fun for the first half-century of its existence….say from the mid 1930’s to mid 1980’s. Like most delightful things in life, the reason behind this is simple. The ideal configuration to move through the water is a parallel-shaped object with an approximate length-to-width aspect ratio of 2:1. And, lo and behold, inflated tubes lashed together tend to be parallel. Further, the original mat dimensions were designed to fit the length and width of the average kid's torso…roughly a 2:1 aspect ratio. So, without even knowing why, mat design was on the right track from Day One. The first mats ever made, way back in the 30’s, would be perfectly fun to ride today. 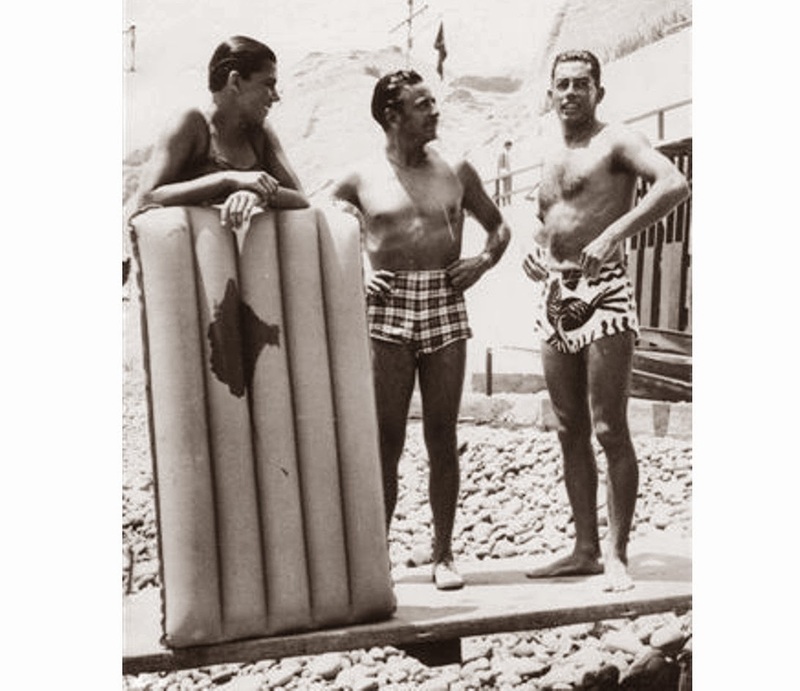 The downside of all this cosmic bliss is that, because other forms of surf craft have evolved so dramatically over the years, it’s natural for surfers to imagine how those same “advancements” might be applied to surfmats. 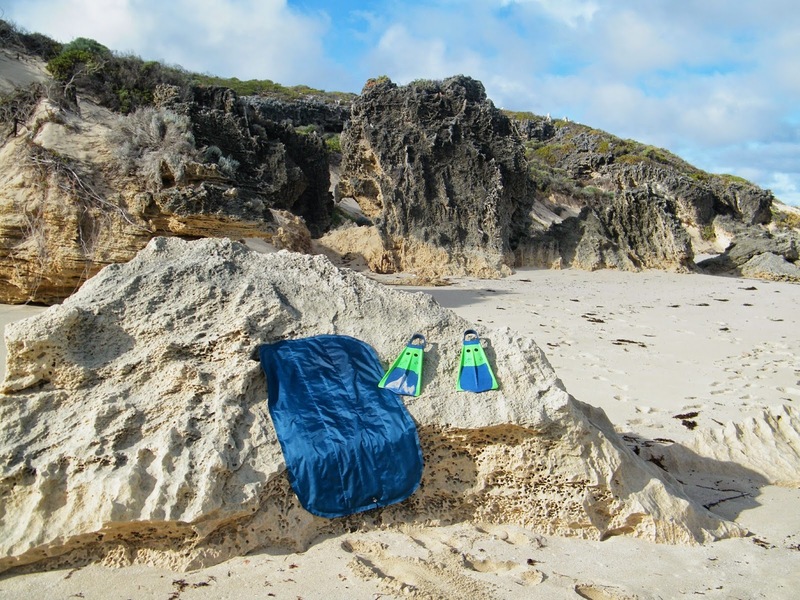 And so, about twice a week, someone sends me an email and asks about trying a surf mat with an outline shape. Some think they should be curved like a surfboard…with a narrower nose and tail. Others go the opposite way, and want to use a concave outline shape, with the outline template generating a wider nose and tail, with a skinnier mid-section. Please don’t misunderstand me, these are perfectly reasonable ideas. George and I have tried them all…or enough of them to realize that tweaking the outline shape of a surfmat not only doesn’t improve the performance, but actually degrades it. There are two main reasons, from I’ve observed. One is that when you cut into the straight outer perimeter weld with either a concave or convex curve, not only is the outline changed, but the thickness flow changes as well. Pull the tail in with an outline curve, and the thickness flow of the outer pontoon in the tail thins out at the same time. So you lose the “hold” of the thick rail line. And that’s a serious drawback. The “undercut” mats (narrower in the middle) work much better than the surfboard-shaped mats…but a mid-section that’s narrower is also thinner, so the noses tend to catch a lot. And the thinner middle drifts around at odd times. 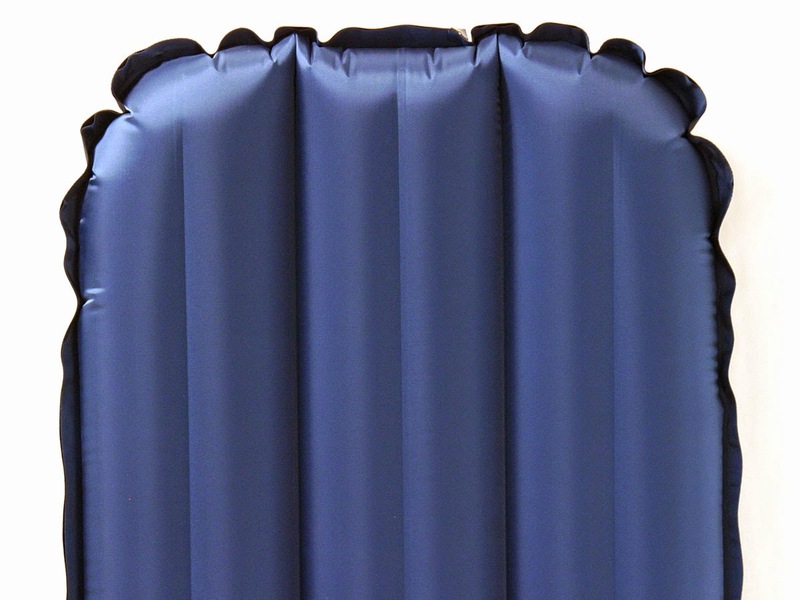 Example of a severely undercut mat. The other downside of a surfboard shape on mats is that the outline curve tends to kick the mat out of its track. Mats need a straight outline and straight thickness flow to keep them moving in a straight line. Essentially, outline curves want to destabilize the mat. And since mats have no fin to rely on, straightness wins the prize when it comes to forward projection. 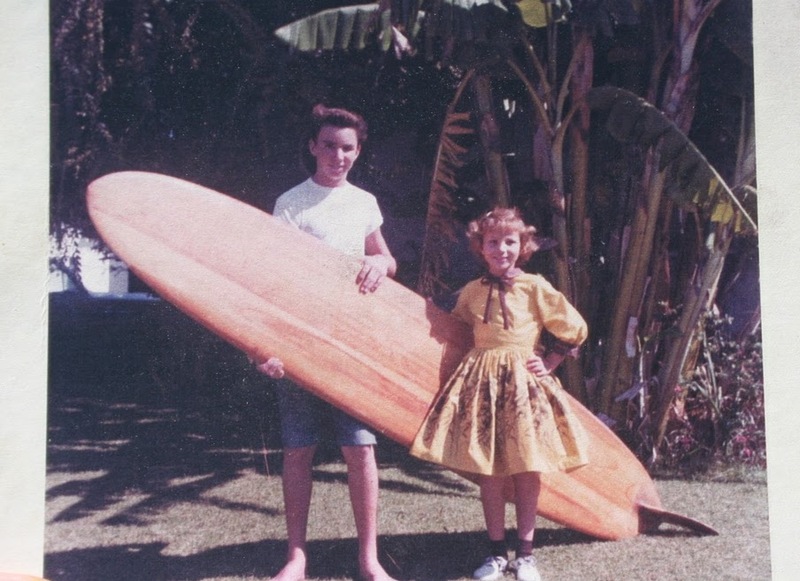 Back in the 90’s, Spencer Kellogg and I started shaping full length Simmons boards (9’ plus). We both assumed that the original Simmons boards, with their enormous tail width, were woefully underfinned. So we dropped a fin box into the first one and stuffed a longboard fin into it, confident we knew what we were doing. Well, that first Simmons board, with a big fin, tracked in a straight line so badly we even couldn't paddle it without falling off the side of the board! 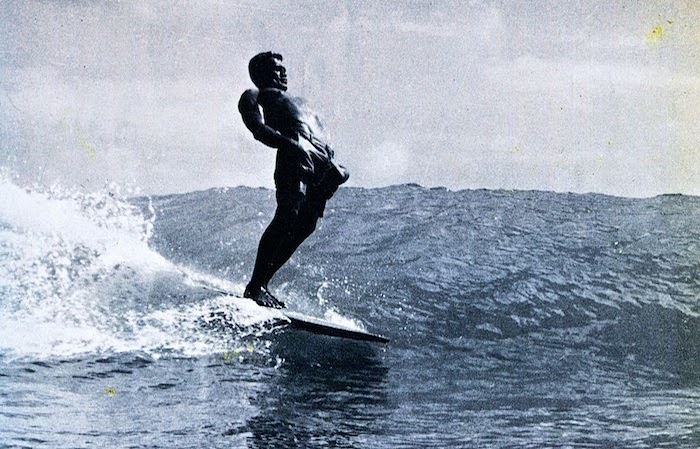 It turned out that a small fin was the right call after all…which was what Simmons had figured out in the late 40s. 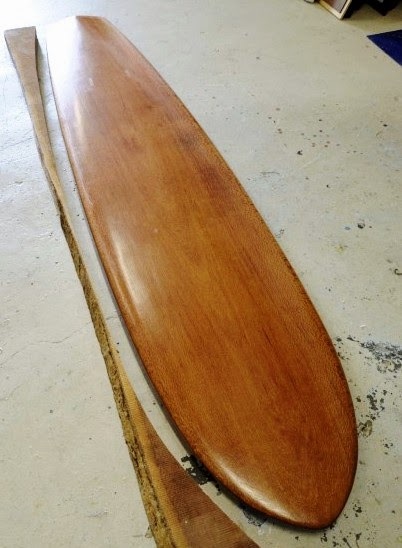 One of our Simmons boards -- a 10'4'' x 24" for Roger Kelly -- with a fin box allowing for experimentation. 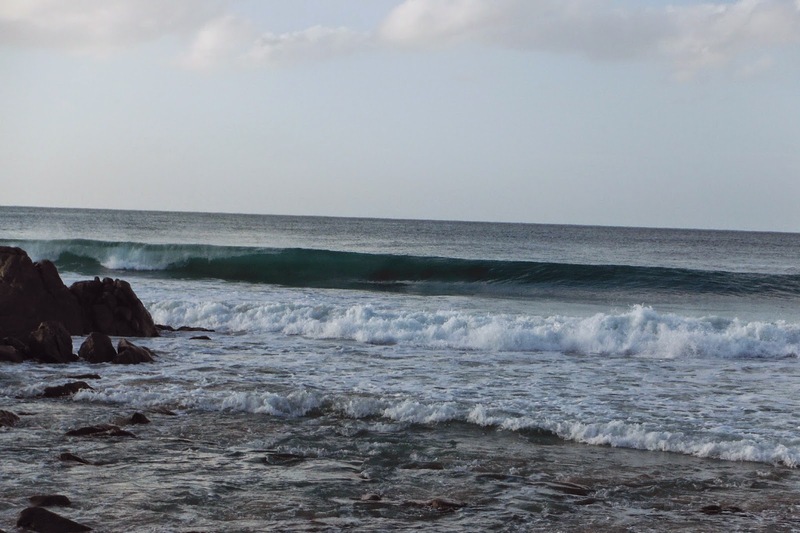 A relatively small Greenough Stage 4 fin worked best, even in Island surf! The conclusion Spence and I drew was that outline curve, not tail width, determined how much fin a conventional surfboard needs. A straight outlined board, like a Simmons, needs less fin area, even though it has a wide tail. A curvy outlined board, like a thruster, needs a lot of fin area, even though it has a relatively narrow tail. 30's era plank. Very wide tail, dead straight tail outline, surfs OK with no fin. Restored early 50's Simmons board. Wide tail, slight outline curve, works best with a small fin. Mid-50's era Velzy Pig. Narrower tail with lots of outline curve, much bigger fin. 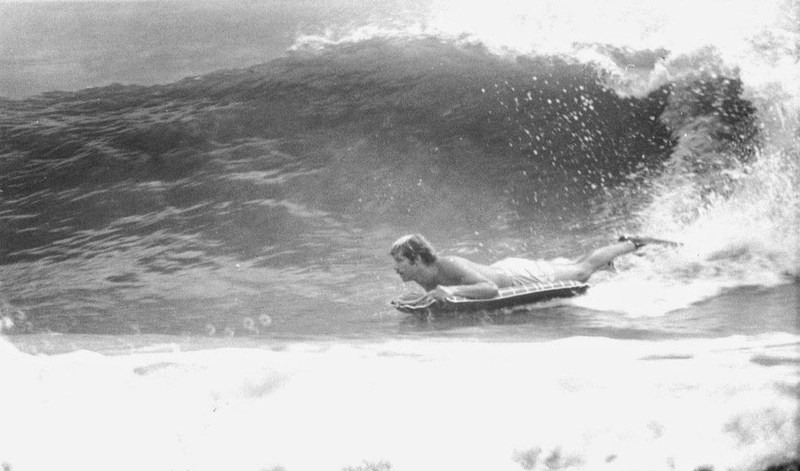 Early 80's Simon Anderson Thruster. Narrow, very curvy, needs lots of fin area. 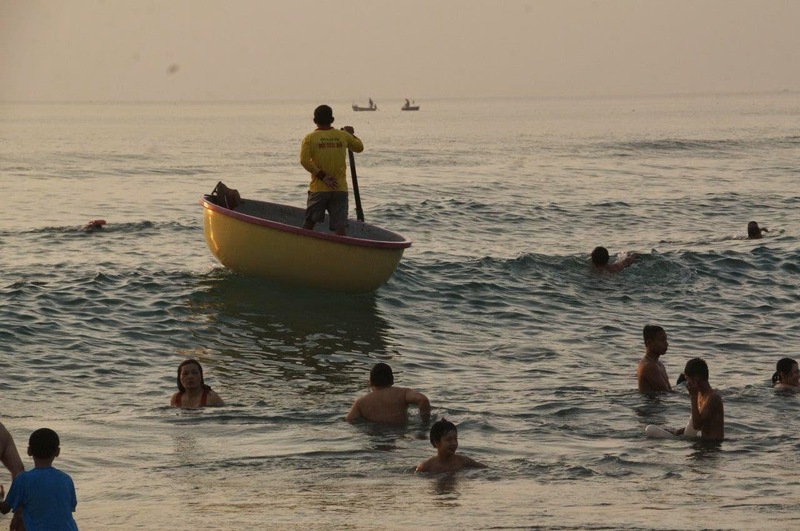 The ideal surf craft, in terms of moving efficiently through the water, is a parallel shape with an aspect ratio of around 2:1. 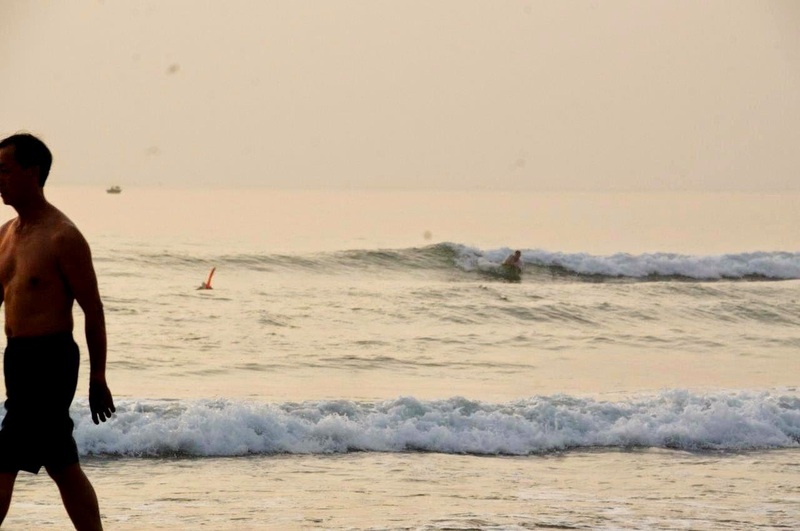 A surf craft with a perfectly straight, parallel outline needs little or no fin area to surf well. Mats naturally fit both criteria. What makes this favorable outcome so cool is that it came about by engineering circumstance, not design intention! Maybe we should call that phenomenon, "Mat Surfing's Law of Dynamic Positives." This park is opening up a month from now! It's not far from my house. Check out the website... It's all about inflatables in the surf! I mean, look at the pictures! There are some insane mat rides possible here... I wonder if they allow visitors to bring in their own inflatables? I'll check it out for you. Las Vegas could be a new market for 4GF mats! Cowabunga, indeed. Just thought I would drop you a quick hi, shot a picture of a fun little wave at middle peak on Thursday, first time i was out in 9 weeks because of some pinched nerves, bulging discs in the neck, epideral shot etc. I did ok on the udt, filled it up first, rode it for an hour, then started to deflate to the 45-90 degree scenario, did very well, got sore, but it was great to get out and have fun. 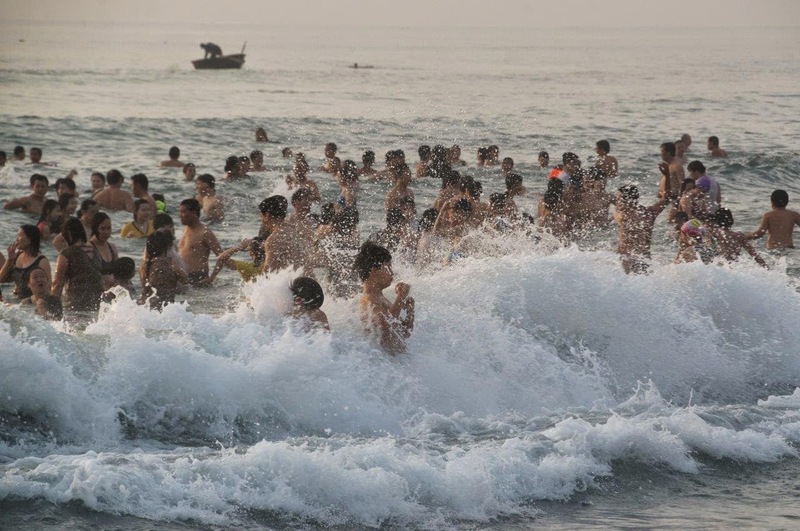 But, after hitting two locals last week in that crowd, decided a surf mat is much more crowd friendly. 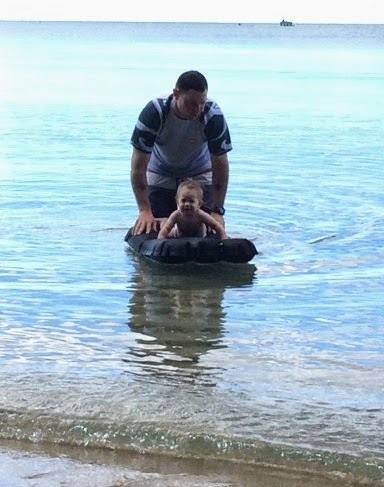 These photos are of Hazel at 5-6 months old on Hickam Beach. Shoot, I should get her a mini mat! Here is Taylor heading out to the Lane to shred on her 4th gear flyer Omni. She is a good surfer and has picked it up fast! Another life enhanced by 4th Gear Flyer!